How do you really know your cuts are coming out in the right place? I wrote a little test program. Or rather, I wrote a program that generates Gcode that can be used for a test. It draws the same pattern in an x by y grid. You tell the program how big to make the pattern (size), and how big the grid should be in x and y (nx, ny) pattern sets. It writes a Gcode file using the filename, and extension, you give it (filename.ext). 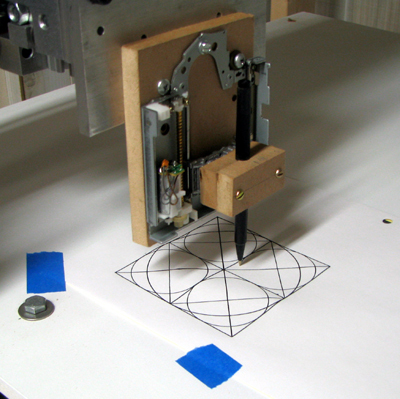 The first pattern drawn/cut is a square. 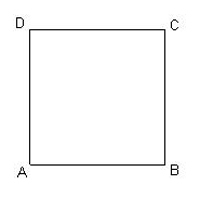 and finishing with D to A. 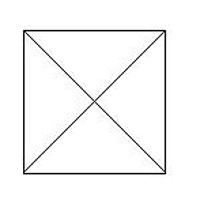 The second pattern drawn/cut is the diagonals of the square. 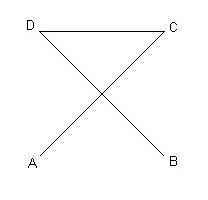 then a line/cut from D to B. The last pattern is the circle inscribed in the square. If you were only drawing a single pattern it would now look like this If you draw multiple copies of the pattern (nx, ny) all of the squares are drawn first starting at 0,0 and incrementing first x then y. 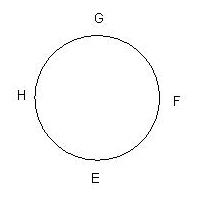 Then all of the diagonals are drawn, and finally all of the circles. The program is written in Python and called cnc_test.py. You can download a copy here along with a sample of the output. Why Python? It's easy to learn. There are any number of on-line documents and tutorials. Error handling and type checking/conversion are built into the language making debugging easier. Although not needed for this program it supports higher level constructs and has math, image, plotting and drawing library support. It's open source and available for both Linux and Windows. Go here for more on Python and links to other sites. I also built a pen holder, converting my cnc router into a very expensive flat bed plotter. Most pen holders are made from a pair of telescoping tubes. 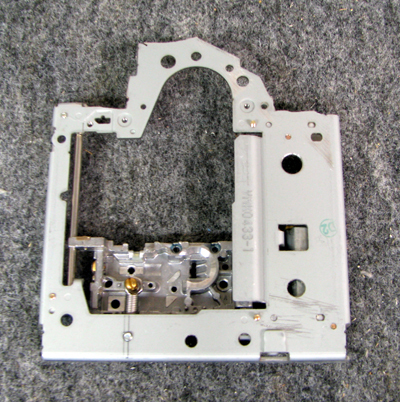 The inner holding the pen the outer mounted to the router. 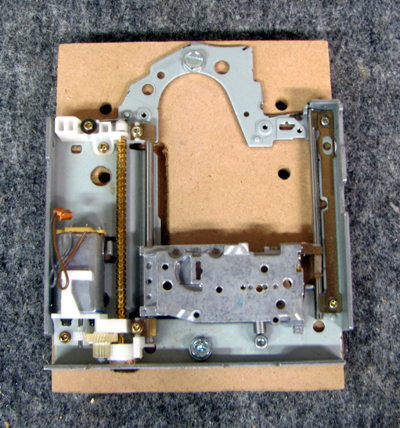 A spring provides the force to pus the pen against the table surface. I didn't have any appropriate tubing. But I did have more than a few dead DVD writers. 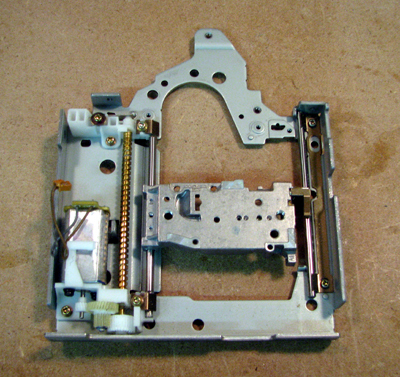 One was disassembled to yeild a sliding carriage to mount a pen onto. 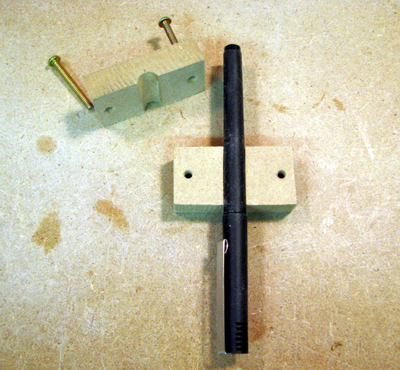 I made a pen mounting block from two pieces of 1/2 inch MDF. The drive slide isn't flat. I machined a mounting block to accomodate. Carriage installed on it's mounting block. Pen mounting block attached to slide. The last two pictures show a single 4 inch diagnostic pattern and then a 2x2 grid of 2 inch patterns being plotted on top. Note that all the edges line up with each other and the diagonals of the 2x2 pattern lie on top of the ones from the 4 inch pattern. 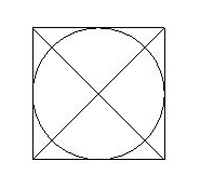 All of the circle edged lie on top of the sides of the squares. Isn't it nice when something works? Gotchas: If you look carefully, you'll notice that the pen is not lined up with the center of the mount. If you compare the pen mount with the router mount you'll also notice that it's not as deep. 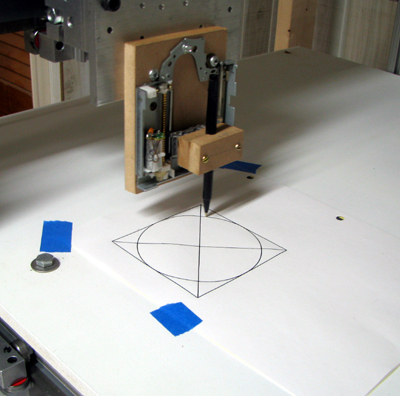 The effect is that the router and the pen cut and draw in different positions. 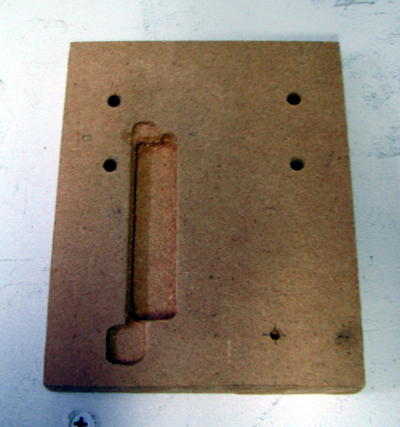 Since most CNC work involves setting the 0,0 position it usually does not matter. 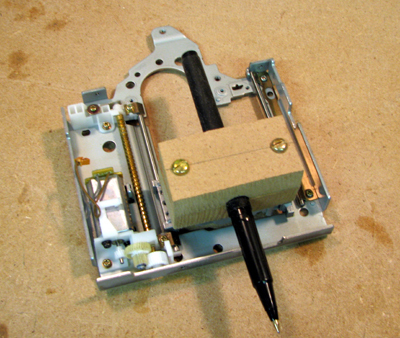 If you were expecting to draw on the workpiece and then cut it in the same locations you'll have to modify the pen mount to match your router. Given the complexity of the above mount, and it's shortcomings, I've designed a second version. It's based on a stubby version of the sharpie marker which I stumbled across iwhile browsing in an arts supply store. compression spring, approx .5 long to fit as shown above.